Tom Ince and Joe Ledley scored debut goals as Crystal Palace moved three points clear of the relegation zone with a win over West Brom. On-loan Blackpool man Ince prodded in a loose ball after 14 minutes and then his corner was headed in by Ledley. Thievy Bifouma came on for his West Brom debut at half-time and scored after just 36 seconds. But Marouane Chamakh scored a penalty after being fouled by Ben Foster as the Baggies slipped into the bottom three. With Scott Dann also making his debut at centre-back, Pulis can only be delighted with the difference made by Ince and former Celtic man Ledley, who played at left-back. Ince, 22, spoke to a host of Premier League clubs last month and wasted little time in proving that he can thrive at the top level. 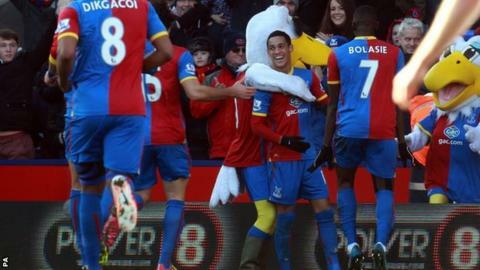 With the former Liverpool forward playing behind Chamakh, with Yannick Bolasie and Jason Puncheon wide, the Eagles looked greatly improved as an attacking force, and scored more than once in a match for just the third time in the league this season. The victory also made it 16 points from a possible 21 at Selhurst Park since Pulis, whose side have won six of their past 12, took over in November. After a wretched first-half display, West Brom improved after Pepe Mel threw on on-loan Espanyol forward Thievy and Scott Sinclair at the break. But after four games in charge, the Spaniard is still looking for his first victory and the Baggies have only won once since they beat Palace at The Hawthorns in November. Victor Anichebe scored his first goal for West Brom in the 1-1 draw with Liverpool last time out but wasted a fine opportunity to give his side the lead here, shooting straight at Julian Speroni after collecting a fine pass from Chris Brunt. Palace always looked more incisive and Bolasie headed straight at Foster from Puncheon's cross. Pulis's side moved ahead when Chamakh's knock-down fell for Bolasie and, as the French winger surged forward, a loose ball fell for Ince to guide a shot into the corner. Craig Dawson then shot over for the visitors, but they trailed by two soon afterwards. No-one tracked Ledley's run and the Welshman met Ince's corner with a firm header from five yards that left Foster with no chance. West Brom could do little with their greater possession but Mel's double change at the break paid off within 40 seconds. Thievy found Anichebe in the area and then got on the end of the return ball before clipping past Speroni. Palace were forced deeper but went close when Damien Delaney flicked on Ince's corner only for Billy Jones to block on the line. Speroni pushed a powerful effort from James Morrison around the post and the goalkeeper also denied Sinclair. West Brom were far more threatening but Palace were rarely stretched and added a third after Chamakh went down under Foster's tackle after a swift break. The Moroccan found the corner with the resulting penalty for his fifth league goal of the season. Saido Berahino and Anichebe both went close to a second for West Brom but Palace were also boosted by the return of Glenn Murray as they secured a vital win. "The biggest thing about Tom [Ince] is his work and the way he did all the unglamorous stuff, which all good players do. "We are pleased for him, Dann and Ledley. The big thing is that the players who have been at the football club have done exceptionally well. "The most important thing was the three points. We're in a dogfight with 10 or 11 other teams and it's very important that the group stays together." "The penalty decision was laughable. If it was a penalty then it would have been a red card. I think the penalty decision really did prevent us from getting anything from the game. "I'm extremely angry. In the first half we really did gift it to Crystal Palace. "I really would like to know why we started so slowly." Check out photos from Saturday's Premier League matches on the BBC Sport Facebook page. Match ends, Crystal Palace 3, West Bromwich Albion 1. Second Half ends, Crystal Palace 3, West Bromwich Albion 1. Corner, West Bromwich Albion. Conceded by Jerome Thomas. Attempt saved. Mile Jedinak (Crystal Palace) right footed shot from outside the box is saved in the bottom left corner. Joe Ledley (Crystal Palace) wins a free kick in the attacking half. Chris Brunt (West Bromwich Albion) wins a free kick on the left wing. Foul by Glenn Murray (Crystal Palace). Corner, Crystal Palace. Conceded by Craig Dawson. Attempt saved. Billy Jones (West Bromwich Albion) left footed shot from the right side of the box is saved in the bottom right corner. Substitution, Crystal Palace. Jerome Thomas replaces Marouane Chamakh. Attempt missed. Victor Anichebe (West Bromwich Albion) right footed shot from outside the box is just a bit too high. Assisted by James Morrison. Attempt saved. James Morrison (West Bromwich Albion) right footed shot from the left side of the box is saved in the bottom right corner. Corner, West Bromwich Albion. Conceded by Jonathan Parr. Chris Brunt (West Bromwich Albion) is shown the yellow card. Scott Sinclair (West Bromwich Albion) wins a free kick in the defensive half. Foul by Thomas Ince (Crystal Palace). Foul by Victor Anichebe (West Bromwich Albion). Attempt blocked. Saido Berahino (West Bromwich Albion) left footed shot from outside the box is blocked. Assisted by James Morrison. Corner, West Bromwich Albion. Conceded by Yannick Bolasie. Attempt blocked. Victor Anichebe (West Bromwich Albion) left footed shot from the right side of the box is blocked. Assisted by Chris Brunt with a cross. Attempt blocked. Saido Berahino (West Bromwich Albion) left footed shot from outside the box is blocked. Assisted by Victor Anichebe. Substitution, Crystal Palace. Glenn Murray replaces Jason Puncheon. Substitution, West Bromwich Albion. Saido Berahino replaces Claudio Yacob. Goal! Crystal Palace 3, West Bromwich Albion 1. Marouane Chamakh (Crystal Palace) converts the penalty with a right footed shot to the bottom right corner. Penalty conceded by Ben Foster (West Bromwich Albion) after a foul in the penalty area. Penalty Crystal Palace. Marouane Chamakh draws a foul in the penalty area. Attempt saved. Scott Sinclair (West Bromwich Albion) right footed shot from the centre of the box is saved in the centre of the goal. Attempt blocked. Youssuf Mulumbu (West Bromwich Albion) right footed shot from outside the box is blocked. Corner, West Bromwich Albion. Conceded by Julian Speroni. Attempt saved. James Morrison (West Bromwich Albion) right footed shot from outside the box is saved in the top right corner. Claudio Yacob (West Bromwich Albion) is shown the yellow card. Attempt saved. Thomas Ince (Crystal Palace) header from the right side of the box is saved in the top centre of the goal. Attempt missed. Yannick Bolasie (Crystal Palace) right footed shot from the centre of the box is high and wide to the right following a corner. The closest relegation battle in history? Read more on Premier League: The closest relegation battle in history?